Refer your friends to Seattle's best plumbing company. Our next Customer Referral Program designed to reward customers for recommending our business to friends and family is underway. Our prize for this drawing is $500! Hey, nothing like getting cash! And all you have do is recommend us to people you know. * Refer our plumbing and heating services to your friends and family have them mention your name when they call us. 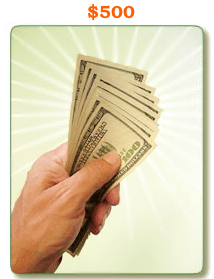 We'll enter your name into a drawing for every referral you send us during this six-month period. At the end of six months, we have a drawing for the prize and deliver this terrific prize to the winner with big smiles, a camera, our congratulations, and appreciation. PS: We have launched Seattle Plumbing Blog, on which we encourage you to share your thoughts and ideas. I sincerely thank you for your time in reading this and look forward to many more years serving you as your plumbing professional. Referral Drawing Winner is Cindy Levy! Congratulations to Cindy Levy of Mercer Island. Cindy has been a customer of Fox Plumbing & Heating for over 4 years. She is a Mercer Island local. She recently referred us to friends, family and neighbors. 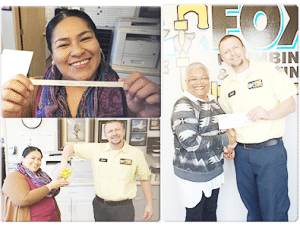 She we drawn, at random and we couldn't be happier that she won our referral drawing for March! Cindy has said that she plans on doing some home repairs with her winnings from the referral drawing. From all of us here, we thank Cindy for the referrals and for being such a wonderful customer of Fox Plumbing & Heating. Referral Drawing Winner is Margaret Chon! Congratulations to Margaret Chon of Seattle. 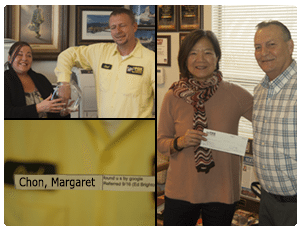 Margaret is the Fox Plumbing & Heating Referral Program Winner for November 2016. She lives on a houseboat in the Seattle area and has used Fox numerous times since first calling us December of 2015. She has been such a great champion of Fox that she's referred us to several of her neighbors, which is why she is our November Referral Winner! Margaret found us on Google and has used Fox Plumbing & Heating, and she's referred numerous customers to Fox over the years. Referral Drawing Winner is Carolyn Hawkins! Congratulations to Carolyn Hawkins of Seattle. She is the Fox Plumbing & Heating Referral Program Winner for March 2016. Carolyn is a long time customer of Fox Plumbing & Heating, and she's referred numerous customers to Fox over the years. Referral Drawing Winner is Mike Summers! 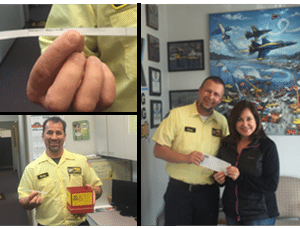 Congratulations to Mike Summers, the winner of the Fox Plumbing & Heating Referral Program. Mike is from Lake Forest Park and he’s referred several people to Fox Plumbing & Heating. We want to thank Mike who thinks of Fox Plumbing & Heating when he has a friend, family member or neighbor who needs a license and bonded plumbing, cooling and/or heating service in Seattle or King County. Referral Drawing Winner, Russell Hall! Congratulations to Russell Hall, the winner of the Fox Plumbing & Heating Referral Program. Russell is from of Seattle, Washington and he's been a long time customer and referrer of Fox to his friends and family. 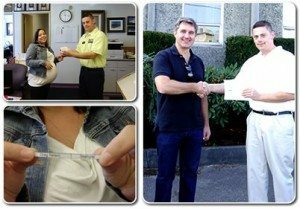 We want to thank Russell and everyone else who thinks of Fox Plumbing & Heating when you have a friend, family member or neighbor who needs a guaranteed plumbing, cooling and/or heating service in Seattle and all of King County. Referral Drawing Winner, Sara Kruse! Congratulations to Sara Kruse, the winner of the Fox Plumbing & Heating Referral Program. Sara Kruse is from of Kirkland, Washington. Sara is the proud mother of five, and she has big plans for her winnings. Thanks again, for referring Fox Plumbing & Heating to your friends & neighbors. Referral Drawing Winner, Chris & Roberta Fredrick! 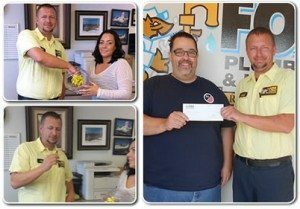 Congratulations to Chris & Roberta Fredrick, the winner of the Fox Plumbing & Heating Referral Program. Chris & Roberta are from of Seattle, Washington. We always enjoy rewarding our customers. Referral Drawing Winner, Chris Antonelli! 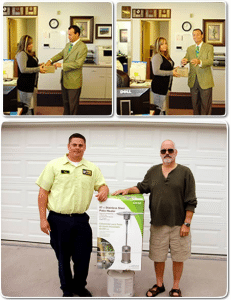 Congratulations to Chris Antonelli, the winner of the Fox Plumbing & Heating Referral Program. Chris is from of Auburn, Washington. We always enjoy rewarding our customers. 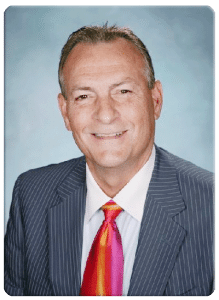 Congratulations to John Brondello of Mercer Island! He is our Drawing Winner for April, 2013 of the Fox Plumbing & Heating Referral Program. Our winner is John Brondello from Mercer Island, Washington. 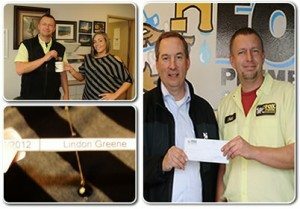 Congratulations to Lindon Greene of Burien! Lindon is our September winner of the Fox Plumbing & Heating Referral Program. Lindon Greene is from Burien, WA. Tina Kotzur of Seattle Wa. 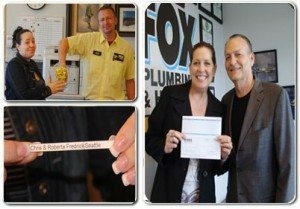 Congratulations to Tina Kotzur, our March winner of the Fox Plumbing & Heating Referral Program! Tina Kotzur is from Seattle, WA. She is a long time customer and has referred many customers to us. Tina's plans for her winnings is to donate the $500 to a foster organization that she admires! Congratulations to Greg Nelson, our September winner of the Fox Plumbing & Heating Referral Program! 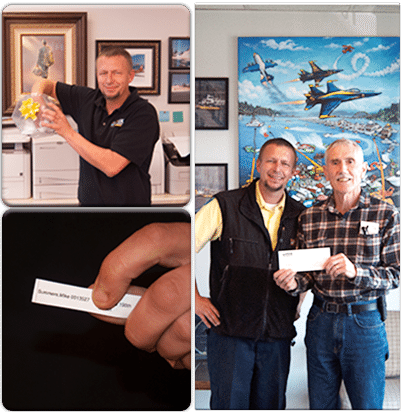 Fox's Ted Candy, presented $500 to the winner of our drawing, Greg Nelson from Seattle, WA. "I have been using Fox Plumbing at my house and commercial properties for the last couple years and they have done an outstanding job on every project. They arrive to site, get the problem diagnosed and repair in a quick, efficient and professional manner. I have recommended them to several friends and co-workers and will continue to use them for my plumbing repair, drain cleaning and service needs". 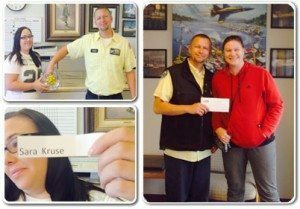 Referral Drawing Winner, of Seattle Wa. Congratulations to Patricia Collins, our March winner of the Fox Plumbing & Heating Referral Program! 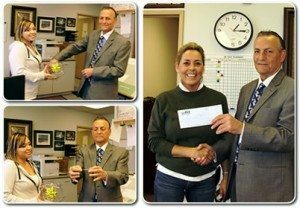 Fox Plumbing and Heating's, Ted Candy, presented $500 to the winner of our drawing, Patricia Collins from Seattle, WA. 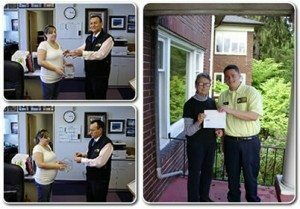 Congratulations to the September winner of the Fox Plumbing & Heating Referral Program! 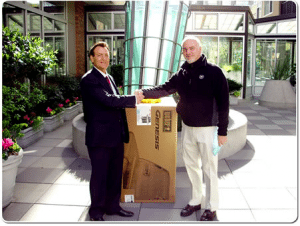 Fox Plumbing and Heating's, Ted Candy, presented a great Patio Heater valued at $250 to customer, Bob R. of Seattle, WA September 15, 2010. "Started using Fox Plumbing about 29 years ago and have always been real happy. Fox re-plumbed the entire house and was really happy with the whole experience. A few years after that called another plumbing company in an emergency situation and what a mistake that was! But hey we all make mistakes… A few years back we had a real bad snow fall and had to call Fox, I was very impressed that the technician stayed to finish the work and did not run out due to the snow. He stayed, worked, and finished the job. Have always recommended Fox! " 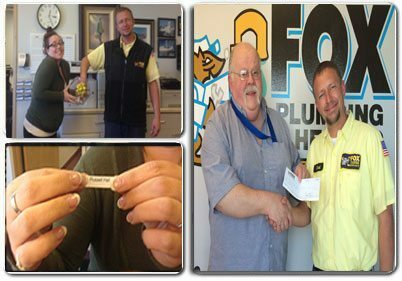 -Bob R.
Congratulations to the first winner of the Fox Plumbing & Heating Referral Program! Fox Plumbing and Heating owner, David Brown, presented a superb Weber Barbeque valued at $800 to customer, David Marcarian of Seattle. "We were in a bind. The faucet broke while out of town, and after contacting several companies, only Fox Plumbing was able to send someone out right away. They repaired the problem perfectly the first time, saving us thousands in damage. Not only do I highly recommend them, but you can bet I will be using them exclusively in the future. Thanks Fox!" -David M.